DRAG RACE: FERRARI 458 SPECIALE VS Porsche 911 GT3 RS 4.0! Lately, more and more exotic supercars are going down the twin turbo route. That said, naturally aspirated beasts such as the Ferrari 458 Speciale and the Porsche 911 RS GT3 4.0 have seen their enormous value exploding. What this means is that many owners of such atmospheric monsters are giving these special edition cars the feared garage queen treatment. However, some passionate owner and drivers of such cars decide to use these RWD legends as their builders intended. We have the latest example in the video below which is a drag race that puts the Italian and the German in a drag race without the slightest amount of mercy. 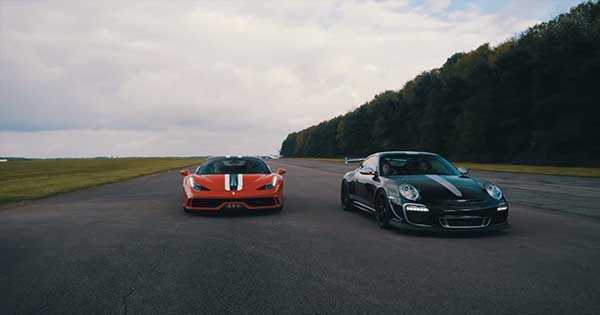 The Maranello and Zauffenhausen beasts were joined together on the United Kingdom`s Bruntingthorpe Aerodrome for the ultimate sprinting battle. However, this sprinting battle between the Ferrari 458 Speciale and the Porsche 911 RS GT3 4.0 was anything but just and fair. Firstly, the Prancing Horse dominates the Porsche when it comes to power-to-weight ratio. Then you have the Ferrari`s 605HP 4.5L V8 which holds a record for street-legal N/A machine. The Porsche on the other hand has a 4.0L flat-six which produces 500HP compared to the Ferrari`s 650HP. Porsche is known for playing the underdog HP card. However, the Neunelfer is fitted with a six-speed transmission, while the Maranello beast uses a dual-clutch transmission. However, the standing starts and the gearbox difference means that the driver can actually make a difference. You`ll be able to perfectly see this in the footage below. At last, read some more comparison between Ferrari and Porsche!